The potential No. 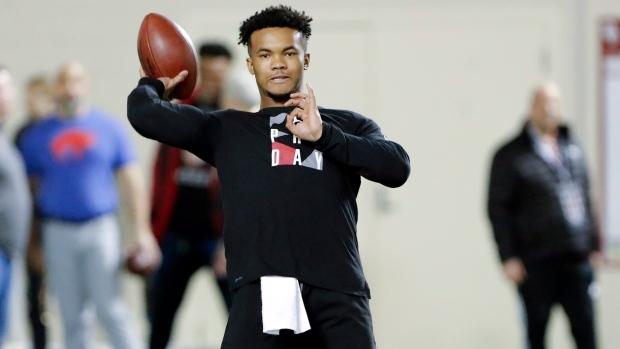 1 overall pick of the 2019 NFL draft, quarterback Kyler Murray, is meeting with the Arizona Cardinals on the University of Oklahoma's campus today, according to multiple reports. The Cardinals, of course, currently hold the drafts rights to the top pick in April's draft. Since announcing on Feb. 11 that he was committing full time to football, the 21-year-old Murray, who was the ninth overall pick in the 2018 MLB draft, has widely been projected to go No. 1 overall in next month's NFL draft. Since announcing on Feb. 11 that he was committing full time to football, the 21-year-old Murray, who was the ninth overall pick in the 2018 MLB draft, has widely been projected to go No. 1 overall in next month's NFL draft. Adding to speculation that the Cards are eyeing Murray for the top pick, is the fact that back on Oct. 28, 2018, now-first year Cardinals coach Kliff Kingsbury told members of the media that he "would take Kyler with the first pick of the draft if he could," back when Kingsbury was the head coach of the NCAA's Texas Tech Red Raiders and Murray still played for Oklahoma. In what was his lone season as a full-time collegiate starting quarterback, Murray led Oklahoma to the College Football Playoff. His campaign included 4,361 passing yards and 42 touchdowns against just seven interceptions. He also rushed for 1001 yards en route to ultimately being awarded the 2018 Heisman Trophy.